How do I log on to your webinar? Click on the event URL in your confirmation email, or copy and paste the URL into a new tab in Google Chrome. Enter your first and last name in the first box and enter your email address in the second box. 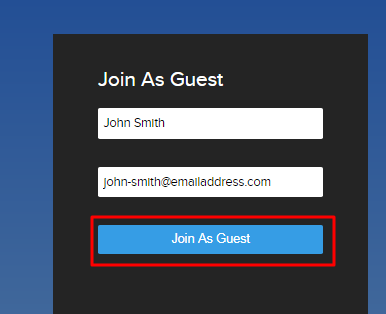 Then click the “Join As Guest” button. What web browser is recommended to attend your webinar? Google Chrome is the recommended browser for all of our webinars. If using Internet Explorer, Flash must be installed and enabled. Please note that Mozilla Firefox is not supported by our webinars. How do I ask a question during a webinar session? 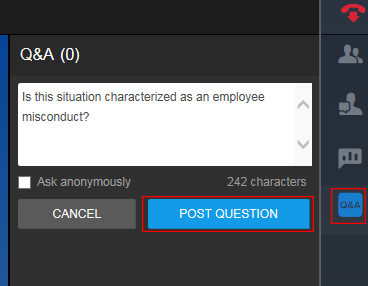 To ask a question during a webinar, please click on the “Q&A” option located in the side menu, enter your question in the Q&A box and click the “Post Question” button. Can I attend your webinar from my mobile device? Our webinar sessions are not compatible with mobile devices at this time and must be viewed from a desktop/laptop. I wasn’t able to attend the webinar – is a recording available? Yes, a link with the webinar session recording will be sent to all registrants even if they were not able to attend the event. How do I get a copy of the slides from the webinar? Once the webinar session has ended, we will send an email to all attendees containing a brief survey as well as the materials from the presentation. I was scheduled to attend an event in-person which has a webinar option. I am no longer able to attend in-person. How can I attend the webinar instead? If you are no longer able to attend an event in-person and would like to change your registration to attend the webinar (if a webinar session is being offered), please let us know in advance by sending an email to conferences@hicksmorley.com and we will provide you with the webinar registration link. Who should I contact if I am having technical difficulties accessing your webinar? Is this session being offered via a webinar? Please consult the Training & Events section of our website to review the specific webpage for the session which will indicate the available formats for each event. Note that workshops, which involve a hands-on component are not offered via webinar. I registered to attend an event, but after I hit the ‘submit’ button, I did not receive a confirmation notice. Am I really registered? Your registration request is being processed and our Events Coordinator will respond promptly. I registered for a workshop but can no longer attend. Can I switch to attend another workshop instead? Yes, space permitting. Please email conferences@hicksmorley.com to notify us of the session you would like to change your registration to. I registered for a workshop but can no longer attend. Can I send another person from my company in my place? Yes. Please email conferences@hicksmorley.com and provide us with your colleague’s contact information and dietary restrictions so that they can be registered in your place. I am on the waiting list for a session. Will I be notified if a spot becomes available for me to attend? Yes, you will be contacted by our Events Coordinator. If you do not secure a spot for this session, you will be given priority registration for the next session on this topic. I am registering more than one person from my company to attend a session. Do I need to fill out a separate online registration form for each person? Yes, registrant data for each individual is maintained within our CRM system for CPD attendance verification. I registered for a session but am no longer able to attend. How do I cancel? Please email conferences@hicksmorley.com to notify us of any cancellations. If you submitted a payment to attend the particular event, we will arrange a reimbursement. Is there a cost to attend an Advantage CPD morning session? No, there is no charge to attend an Advantage CPD morning session. These sessions are complimentary and breakfast will be served. What method of payment do you accept for your workshops? We accept credit card and cheque. I want to register for a workshop. Will I be charged as soon as I submit my form? For registration requests submitted through our website, please note that our Events Coordinator will contact you once a spot has been confirmed for you, and will provide an invoice and payment instructions. For registrations submitted from an email invitation addressed to you, you will have an option to select your payment preference and proceed to either pay by credit card or by cheque. I registered for a workshop but after I hit the ‘submit’ button, I did not receive an invoice. How do I pay for this workshop? Our Events Coordinator will contact you once a spot has been confirmed for you, and will provide an invoice and payment instructions. Can I bring a cheque with me to the workshop? Yes, however we would appreciate receiving your payment in advance. I registered for a workshop but I need to cancel. How do I notify you, and will I be reimbursed? Please email conferences@hicksmorley.com to notify us of any cancellations and we will arrange a reimbursement for payment that has already been processed. If I register more than one person from my organization for a workshop, is there a bulk discount available? To be consistent and fair to all clients and friends of the firm, we are unable to offer discounts for our events. If your organization is interested in training for a large group, consider the in-house training we offer on a flat-fee pricing model. 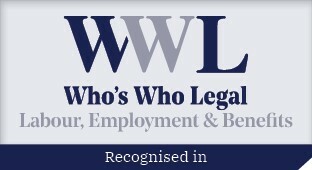 Please consult our client training page for more information. I would like for all of the invoices (for each person from my organization) to come to me. Can I put my own email address on the forms instead of theirs? No. Please include each attendee’s specific email address, as registrant data for each individual is maintained within our CRM system for CPD attendance verification. Upon request, we can arrange to send a copy of multiple invoices for your organization to one email. Please contact conferences@hicksmorley.com. Can you amalgamate all of the invoices for my organization's attendees into one invoice, or will separate invoices be issued? We typically prepare separate invoices for each attendee. Upon request, we can arrange to consolidate multiple invoices for your organization to one invoice. Please contact conferences@hicksmorley.com. How many CPD credits does this session qualify for? Please consult the Training & Events section of our website to review the specific webpage for the session which will indicate the CPD information for each event. Will you be sending me a CPD confirmation/certificate for attending a session? I need proof of attendance to verify my LSUC CPD credits and/or my HRPA credits in the event of an audit. Yes. Following the session, attendees will receive an email confirming their attendance which will contain a copy of the session materials and a feedback survey about the event experience. I can no longer attend. Can the materials be sent to me? Yes, please email conferences@hicksmorley.com to request a copy of the event materials. If the session is being offered via webinar and you would prefer to change your registration, please contact us. Where can I find more information for my organization about hosting an in-house training session? Please consult our client training page and submit the training request form outlining your organization’s needs and we will contact you promptly. My organization is located outside of Ontario. 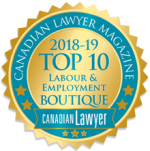 Does your firm conduct in-house training across Canada? 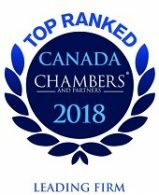 Our lawyers are able to offer training sessions across Canada at any location, and will work with you to determine a mutually agreeable date to schedule the session.